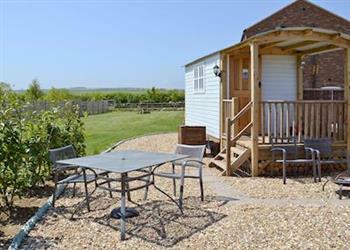 The Blue Texel in Burton Fleming, near Filey sleeps 2 people. 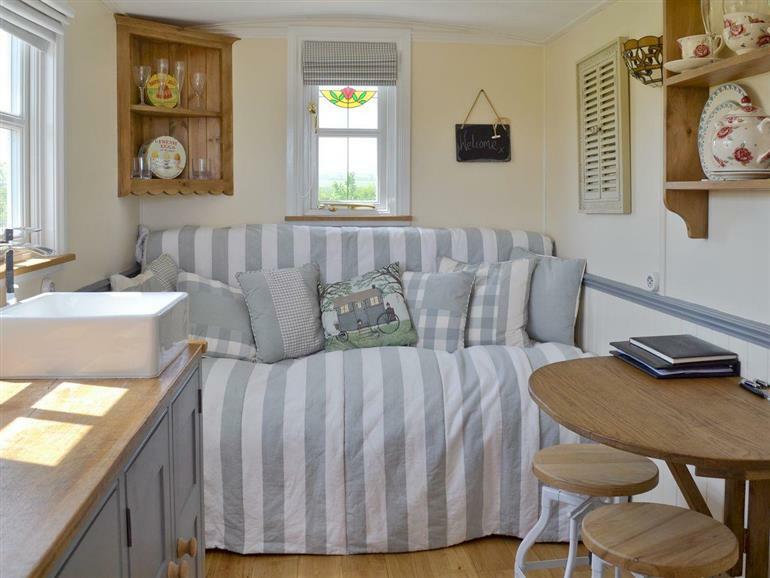 The Blue Texel near Filey is set in the heart of the Yorkshire Wolds, on a working farm, on the outskirts of the village of Burton Fleming; this contemporary shepherd’s hut has been beautifully furnished inside and out to provide couples with an idyllic holiday residence. With Blue Texel’s heart-warming wood burner, there’s a cosy ambience regardless of the time of year, but the real treasure to this hut is its location – just 5 miles to the beach, Scarborough and the North York Moors National Park to the north, the Howardian Hills Area of Outstanding Natural Beauty and the historic city of York to the west, there’s a wealth of attractions and activities to try in the area. For art enthusiasts, the Yorkshire Wolds are the inspiration behind some of David Hockney’s most-loved artwork, and if you’d like to try it yourself, the dramatic Yorkshire coastline would make for a fantastic painting, so be sure to bring your own canvas and brushes. The North York Moors is a walker’s delight, and even cyclists are catered for with the on-site bike store. At the end of the day, there’s nothing like returning to a crackling fire and a glass of wine, or better yet, a dip in the hot tub! The owners, who live adjacent, are happy to provide a free continental breakfast during your stay. The beach is 5 miles from The Blue Texel near Filey. With the shop and pub ¼ mile, and the restaurant is 4 miles. The Blue Texel can be booked together with The Lincoln Longwool (ref UK2065 [The Lincoln Longwool]) and The Swaledale (ref UK2067 [The Swaledale]) to accommodate up to 6 guests. Ground Floor: 5 steps to entrance. All on the ground floor. Living area: With wood burner and Bluetooth stereo speakers (no TV). Bedroom area: With double sofa bed. The external shower room with toilet is shared with 2 other guests, 20 yards away. Electric heater, gas, electricity, bed linen and towels included. Initial logs for fire pit and wood burner included, thereafter £10 per box. Welcome pack. Shared external shower room with toilet. Continental breakfast free of charge and full English breakfast available (at an additional charge). Bar-be-que food packs available for 2. Lawned garden with patio, garden furniture, gas Bar-be-que, fire pit and hot tub. Shared natural grounds with sitting-out area. Bike store. Private parking for 1 car. No smoking. Please note: No children/babes in arms. Holidays at The Blue Texel run from Monday to Monday. For a better idea of where The Blue Texel is, you can see The Blue Texel on the map below. The Blue Texel is in North Humberside; should you be on the lookout for a special offer, you can find all the special offers in North Humberside. It's always worth checking to see what is on offer at the moment. Do you want to holiday near The Blue Texel (UK2066), you can see other cottages within 25 miles of The Blue Texel; have a look to find your perfect holiday location.